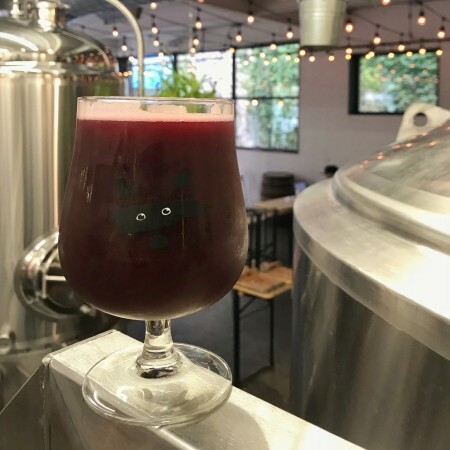 Fall brings an abundance of apples, pears and raspberries and although a berry Milkshake IPA was our main goal, we still wanted something that had a strong berry flavour without completely overpowering the hop aromas. Black raspberries, sweeter and less tart than regular raspberries, quickly became the ideal choice. These type of raspberries are commonly grown in the Oregon region, so keeping up with the series’ travel theme we opted for a quick visit to Portland, one of our favourite beer cities. We added pectin from apples to the initial mash, making the beer even cloudier than our other versions of the style. Mandarina hops were used in the dry-hopping process to provide some citrus aromas and to round out the fruity aromas if the beer. Lastly, the beer was conditioned with vanilla to give it that desired milkshake smoothness and a round lasting taste. YY*→PDX is available now on tap and in bottles at Bandit while supplies last.